Every month we produced a real estate supply and demand report for the purpose of calculating the changes in the relative supply of homes for sale in Tallahassee. 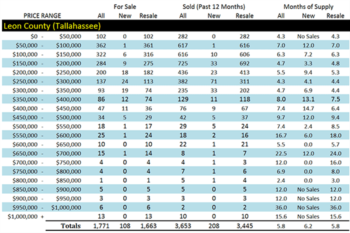 This report contains that information, along with a free downloadable .pdf form showing the months of supply of homes in Tallahassee sorted by area and price range. If you are currently in the market to sell a home in Tallahassee or buy a home in Tallahassee, this one-page reference is absolutely critical in determining the liquidity (competitiveness) of your targeted price range. Use the information in this report to help yourself to the best deal possible in Tallahassee. 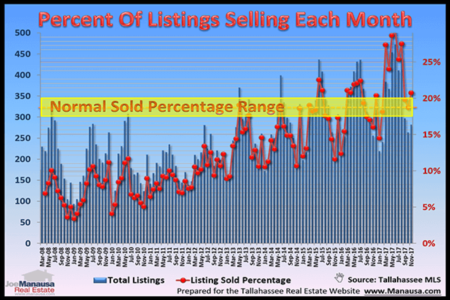 The relative supply of homes continues to improve in the Tallahassee real estate market. The eight-year glut of homes has been reduced to a seasonally adjusted level of 6.6 months of supply, meaning that we are very close to market equilibrium. As a reminder to our newer readers, we consider 6.0 months of supply a “balanced market,” and this is a level last seen in early 2006. But the market is not evenly disbursed across all price ranges. In the real estate graph above, the market is broken down into price ranges along the horizontal axis. The red bars show the current number of homes for sale in each price range (measured on the left vertical axis) and the green bars measure the total number of homes sold in each price range (also measured on the left vertical axis). The resulting months of supply of homes (relative supply) is shown in blue and measured on the right vertical axis. For the most part, the market is in balance for homes priced up to $300,000, but then the glut exists above that point. In order to gain a better understanding of how your targeted area and price range are doing, I recommend downloading the one-page summary by clicking on the image at the right. While the graph above shows a clear image of the overall market, the downloadable report further divides the information into areas as well. Northeast Tallahassee is looking the best, while Southwest Tallahassee has the most challenging road to recovery. If you want to know how your specific home is faring in today's real estate market, simply drop me a note and we will contact you right away.